I recently tried out 'Dip Powder' nails after hearing much talk about them. Prior to trying Dip Nails, I had been getting Gel Polish manicures for the past 5 or so years every 2 weeks. After having the dip nails for a month I thought it would be a good time to give my thoughts on both. * Peels- this is the one thing that really drove me insane, sometimes it would last the full 2 weeks but often it would start peeling up on me all around the cuticle. * Makes nails weak feeling - my nails were very weak when I would let them grow out so they would break really easily resulting in me having to cut my nails very short. * Becomes "dull" looking- the shiny finish would wear off after the first week leaving a kind of scuffed look. * Lasts 3+ weeks - I love changing the color of my nails so I would never go longer than 3 weeks but this stuff lasts forever! * Makes nails stronger - When the dip is on your nails it creates the same hardness as a fake nail which I love as I can't break my nails easily. * Gives nails a great shape- They build up the product on your nails and then buff it into the perfect shape. * Takes 45 + minutes to have done- I have little patience and sitting in a nail salon for almost an hour is not my idea of fun! You have to sit for 10-15 minutes to let the product soak off and then they get your nails ready and begin to apply it, once it's applied they have to go back in and buff and shape your nails and then they add a final clear topcoat. It is quite the process! * Can't get a manicure prior as your nail beds cannot have any moisture on them- as I mentioned previously I really enjoy manicures so it's a bummer you can't get a full manicure when getting the dip powder applied. * Makes nails thicker- since the product is built upon your nails it does make your nails thicker, not as thick as fake nails but the same idea. 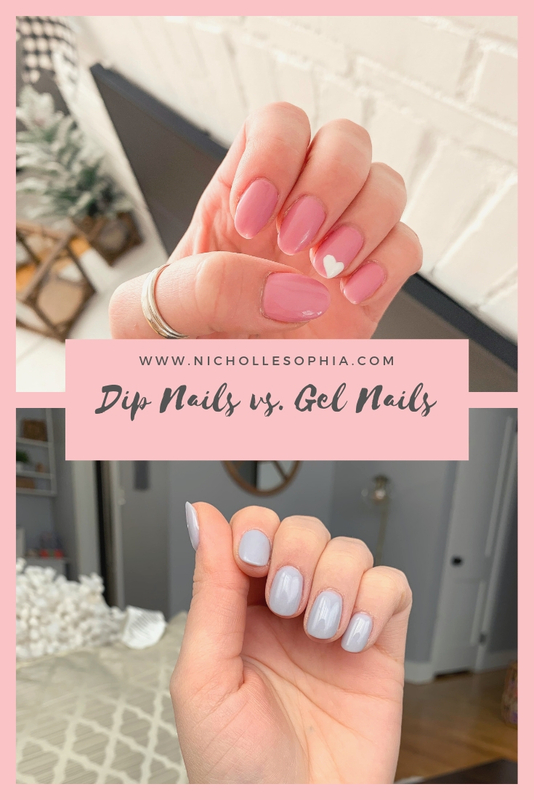 After having both types I can honestly say I like both, that being said I do prefer the dip powder nails as I think they last longer, stay nicer overall and are much more durable! If you're going to spend the money to get your nails done that's the route to go! I felt like with gel nails mine were constantly peeling up on the edges prior to my 2-week appointment which was frustrating. The dip nails stay looking nice in between my appointments and I've yet to have any issues with peeling or breaking. I also love that it makes my nails feel "stronger" whereas, with the gel my nails were very bendy, this allows for me to grow my nails much longer without worrying about them breaking. All of these opinions are my own- of course, everyone will have different experiences with products but these are mine. Let me know if you have any questions!